The Athens bus system is a challenge. Ron had done tons of research and Google street views and we still had massive trouble. We waited for the bus [again], finally figured it was the wrong stop; walked about ½ mile and saw the bus go by on some sort of HOV lane. We crossed to that bus stop and then saw the bus go by at the stop where we had been. We crossed back over and actually caught the next bus. All this walking about did not go unrewarded, however. We passed some gardeners at work and came upon a beautiful modern bronze statue of a young girl. 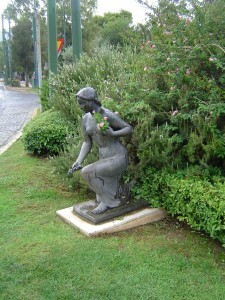 The workmen had placed fresh flowers in her hands. Then we walked by a random ruin covered by a roof to protect it, rather like a bandstand. It was the ground floor of a Roman era home, complete with huge storage pots half buried in what was [probably] the kitchen floor. But the hiking took its toll as well. I was using my cane, knowing that it would be a long day. That and the broken, treacherous sidewalks made for heavy going. I simply did not have the stamina to go all day like I used to. Greece is a nation of ironies: people sweep and even mop outside their own businesses every morning, but ugly graffiti is everywhere. They park on the sidewalks, which is why they are broken. The bus system, as noted above, is poorly labeled and somewhat random as to schedule. But prosperity is also showing: tiny cars and motorbikes whiz around town, while we saw very few bicycles. The other notable luxury item showing up are pet stores; you cannot own a pet unless you have income to spare. But I love Greece. I love the feisty people and their great pride. The adventure of seeing the ruins scattered about. 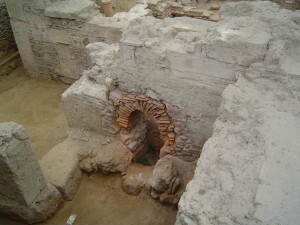 And the sheer age of the place—there are lots of things in Greece older than I am. And even a few have larger thighs. But the museum!! 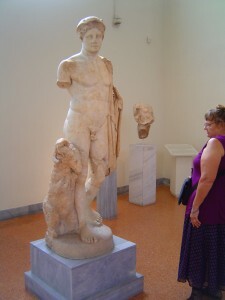 We had been to the Archaeological Museum on our first trip to Athens and I insisted that we go back. 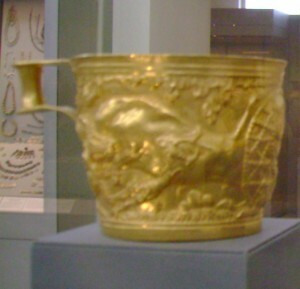 There are more items in this museum that you have seen photos of than any other museum [except the Louvre]. 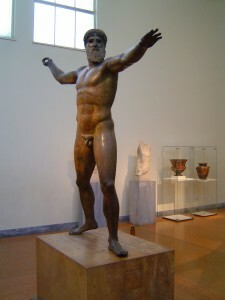 As we arrived, a crew from “Hermes” moving company was installing a new, quite ugly sculpture outside the front door. This is very clever, as Hermes is the god of transitions and deliveries. Then! the incredible news that there was no English guidebook for the museum collection. And the same excuse we heard 15 years ago, “We ran out.” How do you not plan ahead for ordering more? This is so Greek! Nevertheless, we plunged ahead, using the map from their brochure to cover the ground effectively. 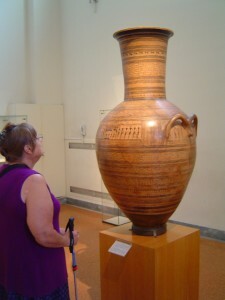 This is one of the huge amphorae from the Geometric Period, about 900-700 BC. There was one statue of a young man who’d had his public hair plucked into a star shape. Bikini wax indeed. 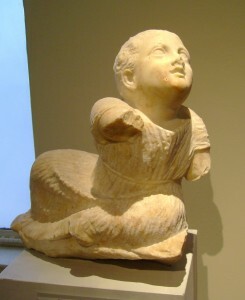 There are enough statues in this museum to truly see the transitions between primitive copies of Egyptian works--that is full frontal, with one leg walking to the front and arms at the side. 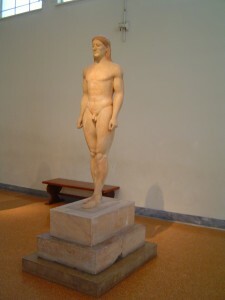 Gradually, the figures begin to show the contrapposto of more weight on one leg and hips tilted, with arms in action. 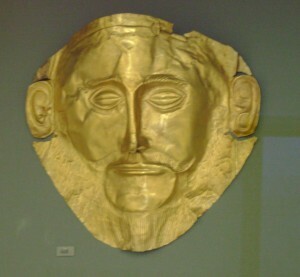 This culminates in the bronzes that are so breath-taking you think they are breathing. Hundreds of grave stelae from the plague of Athens in the 4th century BC bore images of young people and children, more than the soldiers and old folks of the normal graveyard [even in those days.] It amazed me that, in such desperate times, graves were decorated at all, let alone so poignantly. At this point, despite 3 trips to rest and drink at the café, I was absolutely exhausted. It even scared me a little. 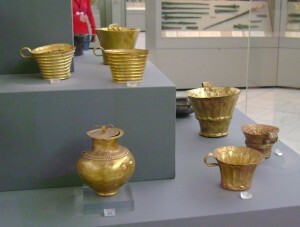 So I insisted on skipping to the gold masks, cups, crowns and jewelry from 1500s BC Mycenae. Last visit, we had started with this and we thought to go the other way this trip. But I thought if I was going to drop dead, I wanted to see this room first. 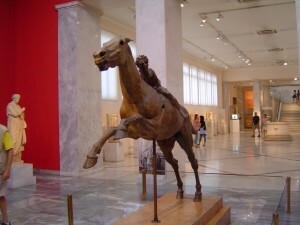 Then I sat near the foyer of the museum while Ron finished the few remaining rooms. Thus I was able to make it to the bus and to the hotel, where I collapsed for 2 solid hours of sleep. Back from the brink of death, we made our way to the Plaka for a blah and hasty dinner. Then we joined the throngs on the Promenade heading for the Odeon of Herodes Atticus. He was a close friend of Augustus Caesar and made huge money procuring goods for the legions. And he “gave back” to his home town [the name “Atticus” refers to the region north of Athens] by building a luxurious theater [odeon, as in nickle-odeon]. In its day it likely had a roof, which is hard to imagine on such a scale in those days. Now it is picturesquely ruined, but for performances, cushions are laid out on the stone benches and modern lighting added. 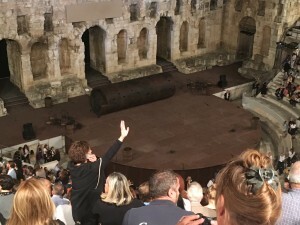 The play we saw was “Oedipus Rex.” A 2600 year old play by Sophocles in a 2000 year old odeon—see, I told you some things are older that I am. The company performing was Russian, dressed in an intriguing mix of modern clothing with Classical touches. Super-titles were in Greek and English, but there was really little need for the words, as the acting was brilliant. Russian is such a passionate language that the very tone of voice conveyed meaning [that is, if you knew the rough outline of the play]. After a standing ovation, we all streamed out of the odeon and along the Promenade, dodging the motorcycles that are prohibited from using the broad walkway, but do it anyway. And to sleep, perchance to dream.